I think it was the early 90s when my mom started cooking with salsa. Back then, it was an exotic sauce that everyone was talking about. My mom used it in everything. Okay maybe not everything, but it seemed that salsa was included in many of our meals. We had fajitas, tacos, dips and my mom’s specialty, chicken breasts covered in salsa and cheese. Yum! Nowadays, salsa isn’t exotic and most people have a jar or two in their homes. You know what’s even better than the salsa in a jar? Homemade salsa, of course! Nothing beats the fresh flavour of garden veggies, herbs and spices. I can eat it right out of the bowl by itself (and I’ve done that on more than one occasion!). Unfortunately, I have a black thumb so I don’t have a garden with fresh veggies. Let’s just say I’m having trouble keeping the hostas alive this summer so I doubt veggies would stand a chance under my care. Good thing there is the farmer’s market and friends and family members with green thumbs. Finding fresh garden veggies and herbs is a non-issue. Making your own garden salsa couldn’t be easier! Don’t you just want to dig in? So so good. 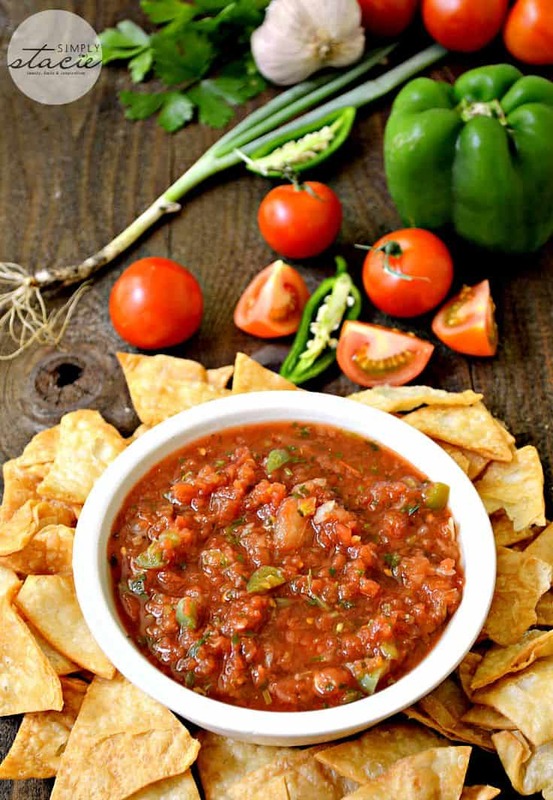 Serve your Garden Salsa with some tortilla chips – bonus points if the chips are homemade too! Or just pour some into a dish and eat. I won’t judge, promise! Whip up a batch and let it sit in the fridge for a day to really let the flavours mingle together. For more salsa recipes, check out Slow Cooker Salsa Chicken, Salsa Chicken and Rice, Mexican Meatballs and Salsa Deviled Eggs. 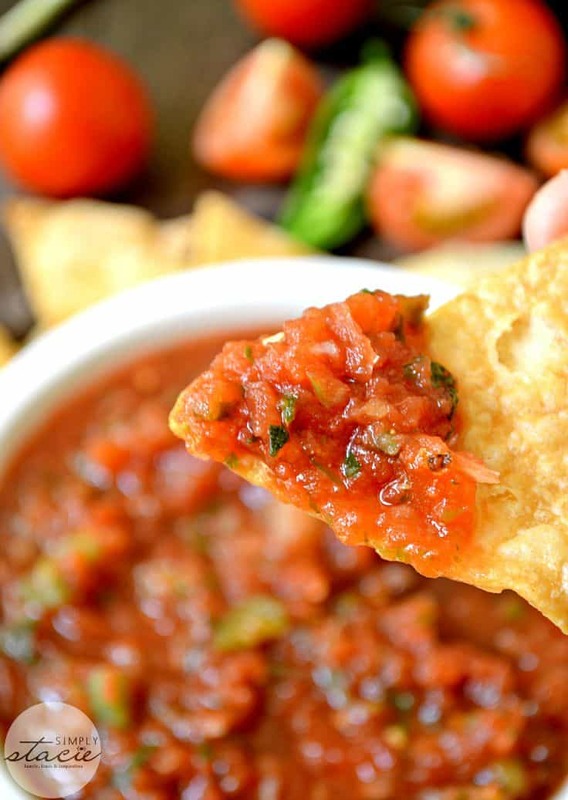 What is your favourite way to enjoy salsa? 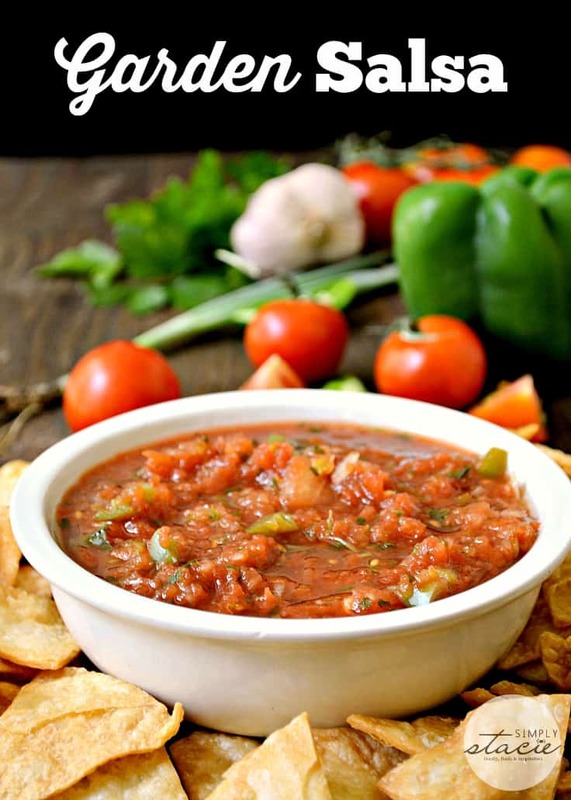 Mouthwatering recipe for Garden Salsa made with fresh vegetables, herbs and spices. Add all the ingredients in a food processor and pulse until everything is combined, diced finely. Be careful to not pulse too much or it will become more like a gazpacho! Taste and adjust the salt/pepper to your taste. It will keep in fridge for about 5 days. 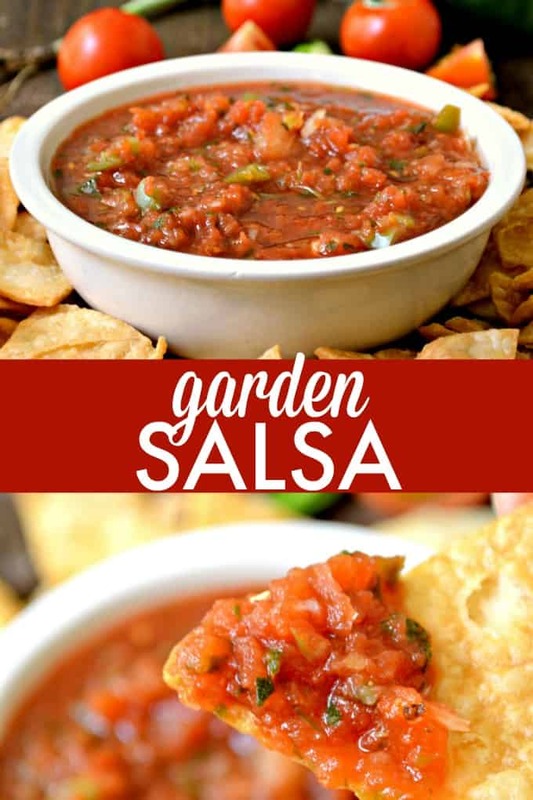 OH I must make this as I love salsa….and I have plenty of tomato’s to do this!! Looks so tasty and I love it on nachos!! This is one of my favorite things to make with the garden produce each year. Tasty! About to pick some tomatoes, this would be great to try using them! I love Salsa and that looks so tasty, can’t wait to make it. Thanks for the recipe, Stacie! This is a must-try recipe! Our family loves taco chips and salsa, especially in the summer! My favorite way to enjoy salsa is with tortilla chips. I love homemade salsa — you just can’t beat the fresh flavours. I usually enjoy my salsa with corn chips. 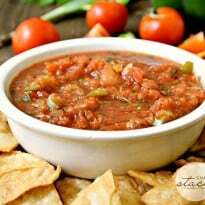 I would love to make my own salsa and this is a great recipe, thanks! all these recipes sound great but its my first time.. I have green peppers, lots of different hot peppers, fresh tomatoes, cilantro, onions and vinegar.. is there a recipe that works with all these ingrediants?